Top government bond closed end funds are Western Asset/Claymore Inflation-Linked Opportunities, AllianceBernstein Income Fund, etc. Investment funds investing in bonds are among the most secure investment options for investors. They provide regular income and protecting capital. Compare to stock funds, bond funds have low risk and volatility. U.S. government bonds funds are utilizing its assets to purchase Treasury bills, notes and securities issued by government agencies including inflation protected bonds. Government bond funds are among the low risk bond funds as well. The other bond funds are international bond funds, corporate bond funds, senior loan funds, multisector funds, etc. Using closed end funds, investors can maximize their returns through leverage and premium/discount from price & NAV (Net Asset Value). The top performing list is sorted based on its year to date performance in 2014. You can find the fund review, performance, expense ratio, dividend yield, fund’s NAV, management, leverage, fund’s sponsor, premium/discount info, etc. Western Asset/Claymore Inflation-Linked Opportunities & Income Fund utilizes its assets to buy inflation-linked securities. This closed end fund is managed by Keith J Gardner, Peter Stutz, and Stephen A Walsh. With total assets of 1.04 billion, the fund’s expense ratio fee is 0.73%. The current yield is 3.34%. This top government bond closed end fund has returned 2.61% over the past 3 year, and 4.92% over the past 5 year. Top 2 sectors are inflation protected bonds (79%), and foreign government bonds (9.8%). The objective of this top CEF fund is seeking to provide current income, with total return as a secondary objective through investment in U.S. Treasury Securities and U.S. Government Agency Securities. This Federated Enhanced Treasury Income Fund has $128 million of market value. The fund manager is J. Andrew Kirschler. It has a high yield of 3.83%. The annual expense ratio is 1.10%. As of June 2013, this DHY fund has a total of 19 holdings. The top sector is U.S. Treasury Securities. 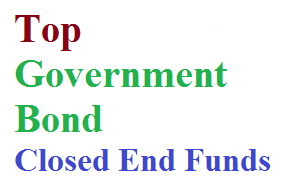 Morningstar ranks this government bond closed end fund with silver rating. It has YTD return of 6.83% as of June 2014. The average maturity is 13.94 years. Top 3 sectors are U.S. Treasuries, Corporate High Yield bond, investment grade corporate debt.